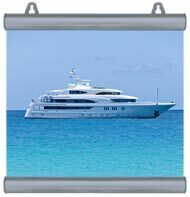 Our Poster Hangers are designed to work with our existing track, hooks and hangers. They are very easy to use and have a snap lock mechanism. We supply the poster hanger profile any length up to a maximum of 3 metres and normally supply 2 per set. One for the top of the poster and one to weigh down the bottom of the poster. The poster hanger is supplied with 2 hanging lugs. The common sizes are 600mm, 900mm and 1200mm. They can also be cut to size.